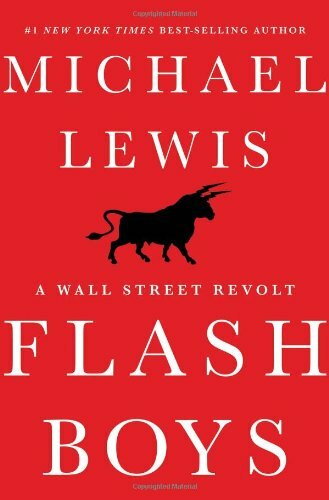 Flash Boys: A Wall Street Revolt, picks its name form “Flash Orders” placed by “High Frequency Traders (HFTs) on stock marking using “proprietary algorithms” and using “speed of transaction” (measured in nanoseconds) as a differentiator, Michael Lewis’ nth attempt at explaining the dark side of wall street. This time, he touches the dark pools as well and the victory of the technologists on the street as well. Phew! So much stock market jargon! Brad Katsuyuma, a reluctant but extremely competent trader with Royal Bank of Canada (RBC), an Asian- Candaian (who doesn’t identity with his Asian identity at all), takes the battle to the Wall Street biggies when his years of understanding the basics of trading are brought to nought by e-trading or HFT. From having a sub-zero understanding of the technology that has changed the rules of the game to the formation of IEX and with a bunch of unlikely heroes by his side, Michael Lewis travels through the evolution of high frequency trading (and to some extent, the Street itself) and the subversion of investor interest by traders. (The word subversion comes a few times when Michael goes through the story of ace Russian programmer, Serge, of Goldman Sachs). One can only speculate where the world goes after IEX. My guess is as good as yours. And my guess is that we are just waiting for new inefficiencies to creep in. In a way, it is like Jana Lokpal. Will you expect the police to be the one to setup a policing regime on their own life. Some of the righteous ones may agree. Some may do it to create the aura of being righteous while figure out a way of subverting it. Most, however, would just refuse. In the end, it all boils down to game theory. Michael puts Brad Katsuyuma and his band of warriors at the center of a right and wrong, good and evil, prey and predator story. The book leaves you with a lot of answered and unanswered questions, especially if you are, like me, an outsider. If you’re one of those who has often wondered about the excessive lifestyles and monies of the investment bankers and traders, and the overall razzmatazz of trading, stock market price fluctuations, options and futures, and what nots, Flash Boys, at the very least, gives you a good ring side view and an access to an exciting commentator of the game. The book also, unlike what you’d expect, is not very judgemental. Brad manages to keep his sanity through till the end, and is able to understand and rationalize the motives, even though he doesn’t always agree with them. I have had similar predicaments. Not just once. A scenario where an extremely profitable engagement depends on one’s ability to downplay the morality of what is being asked for. There is a certain point in Flash Boys, where an analyst explains how his bosses ‘told’ him to prove that the “dark pools” were benefiting the banks’ customers. As an analyst, he knew it wasn’t true. As an analyst, he managed the numbers in a way that it could be proved true. As an IB analyst, or a consulting analyst, tell me if you haven’t been in a similar situation! Yes. One of those. Flash Boys runs like a thriller, jumping timelines & story-lines, weaving a tale of greed, deceit and genius, and is well marinated for being converted into a movie right away. The book is absolutely riveting. The concepts and most technicalities/ stock market actions have been explained in layman terms for people like me who haven’t really cared for them all these years. And I am sure, once could have foreseen why this book would be a bestseller. The way Michael has built each of the key characters is the secret sauce. At the beginning, there were many instances where I could identify with Brad’s inertia or lack of ambition in life a lot. There are also a lot of moments where people would find themselves nodding to certain actions that people like Ronan take. Right down to the defiance and condescence against the apparent ruler and rules of the street. You can’t help but feel a lot of sympathy for Serge, even as you try to wave the corporate ethics and IP protection manual in front of people. I must also confess that I am a little late to the party, and a lot has been written about the book already. However, I do encourage all of you to read the book if you haven’t already. It’s a fascinating read, even though many may consider it a bit one sided, with nothing but Brad’s desire to do right holding him through a lot of those difficult phases. I have no business calling it out as absolutely the unadulterated truth or a blatant lie. Though, I have no qualms in adding that HFTs are supposed to work exactly like they are explained to be in the book. Whether or how it creates a competitive advantage for the one with the best resources, the best access, and the highest level of corporate corruption is something that is and will remain a hypotheses. So go on then. Enjoy it. A definite 4.5 on a scale of 5 for me. Good story, good story telling, great memorable characters. And off I go to the next one! I guess I need to read this as I can’t see the stock market being thriller but I don’t judge a book until I read it! I recommend The Cerulean’s Secret by Dennis Meredith, dennismeredith.com is his site for the book. Good reads out there!